John Carter is the best Star Wars movie since Return of the Jedi. Of course it’s not literally a Star Wars movie, but I dislike the term “Science Fantasy” and so Star Wars will have to satisfy my eccentricities in this matter. John Carter is based on the book “Princess of Mars” by Edgar Rice Burroughs, the first in his Barsoom novels. It concerns the former confederate soldier, the titular John Carter, and his adventures on Mars called Barsoom in the Martian tongue, or should I say Barsoomian? The movie opens with a brief history lesson of Barsoom, telling us that the cities of Helium (good guys) and Zodanga (bad guys) are at war, and their war has ravaged the planet. 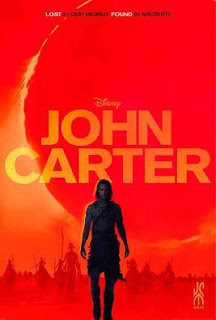 After the history lesson we see John Carter sending a telegram asking his young nephew Ned to come to him immediately. Ned receives the telegram and makes his uncles estate only to find his uncle has passed away and he has inherited his uncle’s estate, holdings and belongings, which includes a journal that was meant for Ned’s eyes only. The journal tells the story of how John found himself on the planet of mars, and what happened to him once he got there. John Carter is the best movie I have seen in theatres this year. Of course that isn’t saying much because it also happens to be the only movie I have seen so far this year, but let me emphasis that no matter what other films I see this year, this film is the one that gives me the most hope for the future of science fiction and fantasy epics to be as grand on the big screen as they are in prose. It is a film that is capable of making you believe in a fantastical world, and capable of using that world to tell a story that is both compelling and touching. Overall John Carter is a thrilling adventure, and in my opinion it definitely surpasses the Star Wars prequels and even rivals the original trilogy. While it may not be a masterpiece or a world changing rhapsody it certainly is a good movie, and I feel that it might just rank up with the classics of its genre someday. John Carter sets itself up for the adaption of the sequel novels by Burroughs and I hope they get made, but unfortunately it is underperforming at the box office and as of this review is in danger of being the biggest flop of all time. I strongly recommend this movie to anyone with a love of Science Fiction, Fantasy, or Adventure. On another note I saw this film in 3d and like most 3d films it was completely unnecessary. If you can find the cheaper non-3d version playing in your local theatre I would advise you to seek it out instead.